This is a sponsored post. I received complimentary admission to attractions courtesy of Visit Tallahassee for purposes of this article. All opinions are my own. Tallahassee, home of the NCAA football champion Florida State Seminoles and capital of the State of Florida, may not be the first place you think of for an adventure-themed vacation… but it should be among the top! My son (Nathan, 20) and I spent a fabulous weekend there recently and found that Tallahassee and adventure go hand in hand. 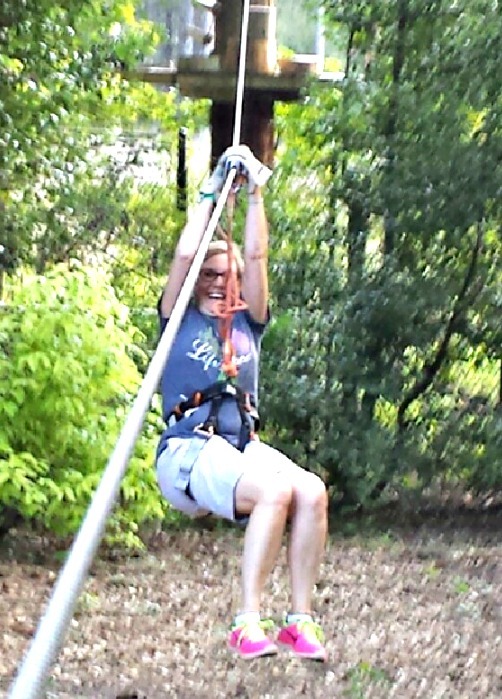 Our weekend began with high flying thrills through the tree tops at Tree to Tree Adventures at the Tallahassee Museum. After a safety briefing, we got harnessed in for our trip through the canopy. We faced challenging obstacles and long zip lines over land, water and even bears! Since I’ve zip lined a number of courses, I really didn’t expect an adrenaline rush from this experience. The combination of high wire challenges and being responsible for my own zip line safety did make this more exhilarating. Of course, like all zip lines, safety is the number one concern. We always had spotters on the ground watching to make sure we did it correctly. 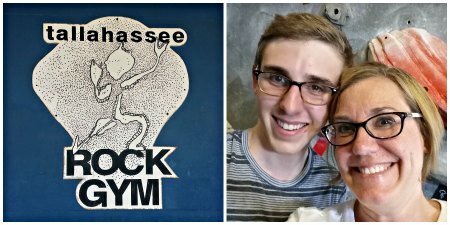 After an exciting day of exploring like monkeys and the muscle pain to go with it, we headed to Tallahassee Rock Gym to try our hand as mountain goats. Our experience began with a lesson in belaying — safety first you know. We then climbed the rock face, increasing the difficulty level as our comfort improved. Okay — I never got past the first level. Nathan did better, though! When my arms gave out, I called it quits and enjoyed watching my son tackle the wall. After flying and climbing, it seemed only fitting to take to the water, exploring the area by kayak. 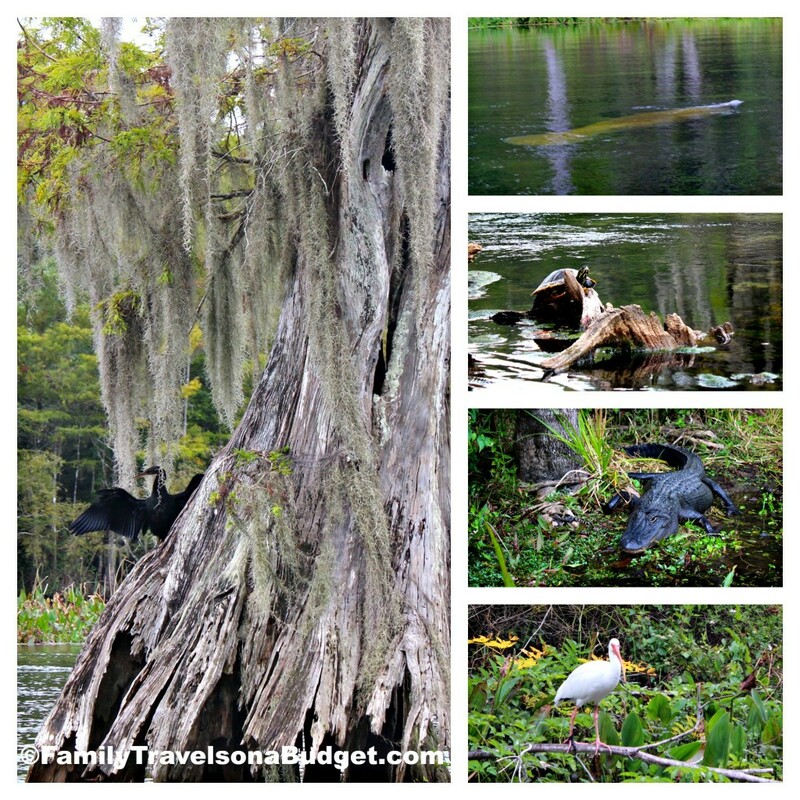 Our guide from TNT Hideaway, an easy drive south of Tallahassee, took us on an escorted tour of the Wakulla River and introduced us to native plants and animals as we searched the river for manatees. When winter temperatures cool the ocean waters, the manatees swim upstream to enjoy the warmer river temperatures. Unfortunately, mid-October is a bit early for manatees, so we didn’t see any. The best time to see manatees in the river is mid-November through February. 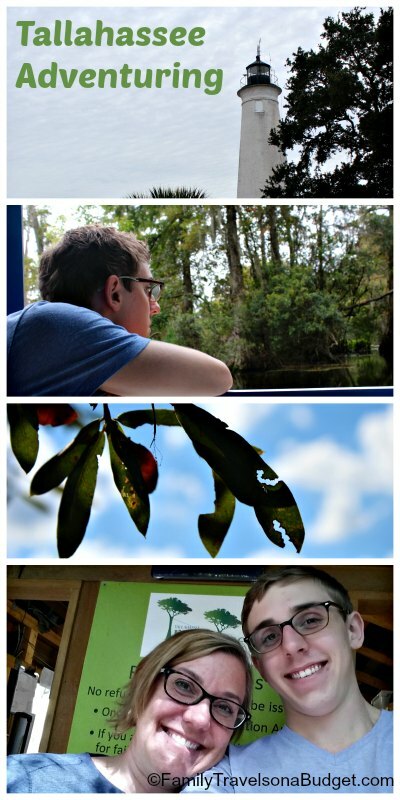 Later in the day, we ventured over to Wakulla Springs State Park for a River Boat Tour and saw four manatees! This state park, originally a private resort developed by philanthropist and conservationist Edward Ball, has been welcoming guests to swim in the 68 degree waters of Wakulla Springs ever since. In 1966 the park was acquired by the Florida State Parks system and since has been visited by nature lovers, movie history enthusiasts and people just wanting to get away and unplug for a few days. The lodge, built by Ball in 1937, is listed on the National Register of Historic Places, and still welcomes guests today — with quiet rooms, historic charm and expansive views of Wakulla Spring. Back to the manatees: Did you know that manatees are the only mammal without a natural predator? The hunt no one, subsisting on a diet of green plants, and they are hunted by nothing — not even sharks or whales. The manatee population’s only threats are boat propellers and trash that collects in the shallow waters off the Florida coast. With more than 600 miles of hiking and biking trails (including dedicated biking lanes on major roadways), Tallahassee and the surrounding area in Leon County are great for adventuring! • The waters of the Gulf of Mexico provide swimming and other water sports fun. By the way…. after three days of Tallahassee Adventuring, I needed another four to recover! Wow!!! I discovered a few muscles I’ve never used before. This definitely was a weekend-warrior themed trip, but it was thoroughly enjoyable. I highly recommend Tallahassee for families wanting a weekend away. It’s a GREAT destination, especially, for active families of upper elementary kids and above. My son and I thoroughly enjoyed our time away together! Head over to Visit Tallahassee to plan your own Tallahassee Adventure. For the “less adventurous,” Tallahassee is rich in culture, the arts and great dining too! Special thanks to Visit Tallahassee and the attractions who arranged this visit for purposes of this post. I had no idea Tallahassee was more than a football town until this trip! Wow, sounds like you had a great time. My kids would love to do something like this. My next article is about my favorite attraction in Tallahassee — so many surprises in this city! It sounds like you had an amazing time in Tallahassee indeed. I have never been there before or even thought about vacationing there but there is amazing things to do for sure. Thanks for sharing. Rebecca, I was so surprised when I visited. It’s totally unlike any other place I’ve ever been — and perfect for families with teens. It’s great for younger kids too — most museums are free and abundant parks — but for vacations with teens it’s tops! I miss going camping and seeing things in nature. Thanks! Zip lining is one of my favorite outdoor adventures. I look tough, but it’s really not that strenuous. Mostly. This one was quite strenuous with the climbing and challenge ropes, but oh how fun! These are such beautiful pictures, you must have had such a great time!